The Eastern Garter Snake is a common, nonvenomous snake. They are most active during the day and although they do hibernate they are active during a wider range of temperatures than other snakes. They hibernate from late October through early April but they can be found sunning themselves on rocks on warm winter days. They are not actually “cold-blooded” creatures; they are ectotherms, which means their bodies are the temperature of their surroundings. They use thermoregulation to control their body temperature. DESCRIPTION: They are abundant in Connecticut and they have a large variety of color patterns. The base body color is usually black, brown, gray or olive. They have three lighter colored stripes that run along the whole length of their body. The stripes are usually white, blue, green, yellow or brown. Their chin, throat and bellies are usually the same color as their stripes. The Eastern Garter Snake can grow to between 1.5 feet and 4.5 feet in length. When they are born they are usually between 5 and 9 inches long. The average weight of an adult is only 5.29 ounces. The females are larger than the males but the males have longer tails. They are sensitive to vibrations, which is a location device they employ. They have large eyes but they have poor eyesight and they mostly communicate with each other via touch and smell. They have a forked tongue that collects chemicals in the air. A special organ in the roof of their mouths interprets the chemicals. 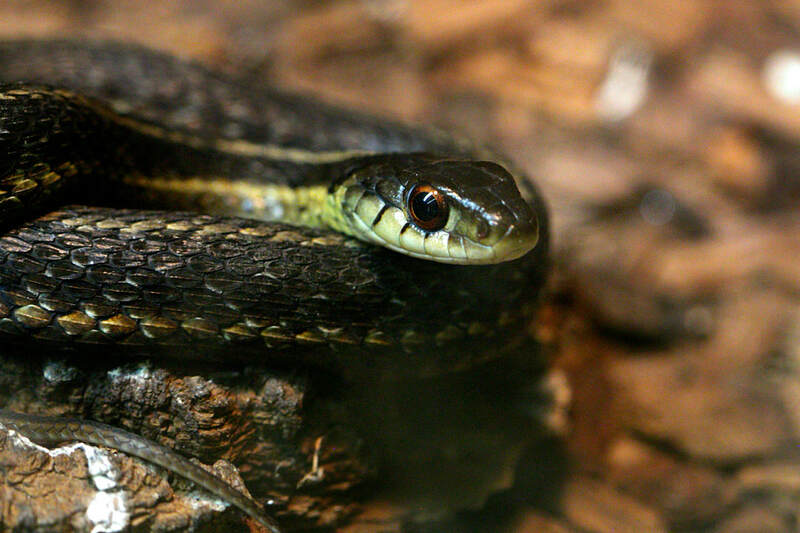 The Eastern Garter Snake has a two-toned colored tongue. They have a forked tongue like other snakes but the tip is black while the rest of the tongue is red. RANGE: They are native to the North American Nearctic region but they can be found all over the United States with the exception of the arid southwestern states. They are widespread and highly adaptable. HABITAT: They can be found in a variety of habitats. They prefer moist, grassy environments. Eastern Garter Snakes may be found in meadows, marshes, and woodlands and are often found near water. They also like urban and suburban areas with plenty of cover. DIET: Carnivores – earthworms, amphibians, leeches, baby birds, small mammals, insects and other small creatures such as fish and even other snakes. FAMILY LIFE: Eastern Garter Snakes are ovoviviparous which means they bear live young rather than laying eggs. Females can give birth to up to 40 live babies per litter. The size of the litter depends on the size of the female. There is no parental care given after birth. The newborn snakes must find their own food. Although they usually live a solitary life, during the winter a large number of them will hibernate together to share body heat. LIFE SPAN: The average life span in the wild is two years. In human care the average is 8 years.